The cover says it all. A lone American soldier is dwarfed by the surrounding stash of bundles, that look suspiciously like paintings, in a church at the Weissenburg-Guzenhausen Residence at Ellingen, Germany, in 1945. The juxtaposition of the church’s lavish interior - used as storage for plundered art - with the soldier is a poignant reminder of the scale of wartime seizures and the enormity of a problem that is as old as art itself and continues to the present day. 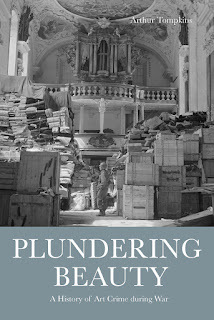 This image is on the cover of Arthur Tompkins’ Plundering Beauty: A History of Art Crime during War, an epic read about the victims of war, art and cultural heritage. Many readers will personally know, or know of Arthur Tompkins, for his scholarship about art crime during war. For several years Tompkins has taught at home (New Zealand) and abroad through the ARCA postgraduate program in art crime and cultural heritage protection (Italy) on this topic and his latest book brings together years of research, thought, and analysis about the art crimes committed during war. Plundering Beauty is a long journey of crimes waged on art. Beginning with exploring the nuances of why art crimes are committed during war, Tompkins embarks on a journey beginning 2000 years ago in Rome. Bit by bit, he un-packages this history of atrocities inflicted on art, both individual pieces as well as collections. Significant (and now famous because of their chequered past) artworks have always been pawns in much bigger context of war booty and in Plundering Beauty we are presented case after case as evidence of this. Plundering Beauty’s catalogue of art crimes continues through to the present day, and not surprisingly, demonstrates the failure of humankind to learn from earlier histories. We are familiar with the crimes committed in present-day Syria and Iraq, and Tompkins’ book is a brutal reminder of these as he provides us with a much wider and broader context, and specific art and cultural object crimes. 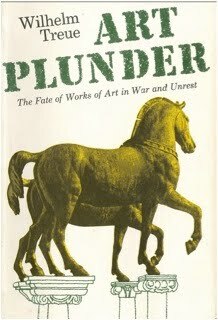 Plundering Beauty does not pretend to be a complete history of art crimes committed during war (I couldn’t help but think while reading this new narrative about all the art crimes committed during war that we do not know about, or have an inkling of but do not know the details of). What Tompkins does provide us with is a cross-section of case studies over time. Wherever there is an art history there is a history of art crime and more often than not, crimes that are bound up in war. Tompkins provides an alternative art history that for so long was ignored by writers. I get the sense that Tompkins has his clear favourites, and why shouldn’t he? He is passionate about his subject matter and it shows. The Four Horses of the Basilica of St Mark and Veronese’s The Wedding at Cana are up there. It is not always about the actual artwork being discussed but rather the back-stories and layers of unravelling necessary to try and see reasons for such crimes. Discussed in detail, yet in a very readable manner, Tompkins’ attention to detail and leaving no stone unturned is in part due to his day job – a judge. And as the reader you feel satisfied with how he presents each case. A reminder though, is that this a book about crime, and as always with crime, not all cases are solved. For example, Raphael’s Portrait of a Young Man sadly remains at large. Other artworks are re-discovered or have closure many years after the original crime. Gustav Klimt’s Portrait of Adele Bloch-Bauer is a case in point. The work, seized by the Nazis during World War II was eventually reunited with the owner’s heirs in 2006 after what Tompkins describes as a tortuous legal battle fought in both Austria and the United States. The narrative is chronological making it easier to align with world history and art history, as written in the Western tradition. 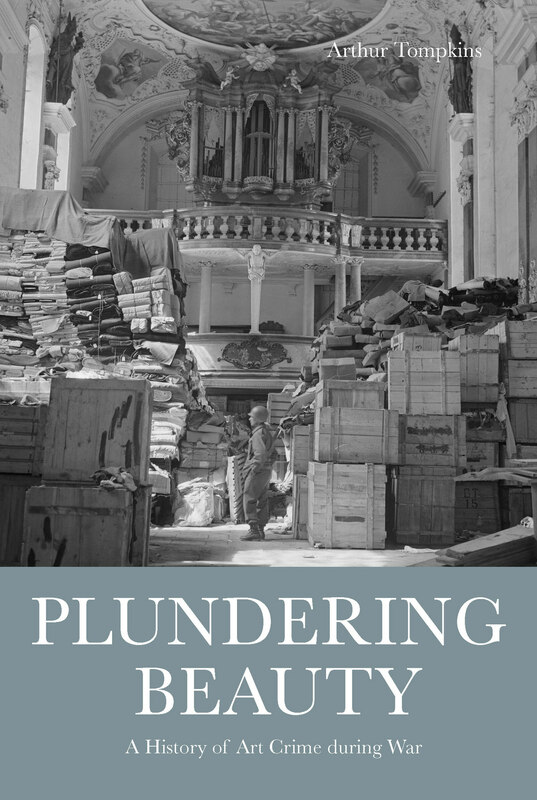 Plundering Beauty also reveals the unfair nature of art crimes during war. Take Johannes Vermeer for instance. He only painted approximately 35 works total during his entire working career and yet three feature in this book. Perhaps this is because they’re stunning works, much adored and highly desirable. It could be that they are small and therefore easy to plunder. Tompkins inspires his reader to ruminate on such matters, meaning the book’s contents stay with you long after you’ve finished reading it. Yesterday provenance scholar Yagna Yass-Alston, a specialist in the history of Jewish artists and collectors, alerted ARCA that a version of 19th century painter Henryk Siemiradzki's “The Sword Dance," is currently up for sale in the November 28th Russian Pictures auction to be held at Sotheby’s in London. The painting appears to be on offer through a private German collector who acquired the painting through his parents circa 1960. Yass-Alston noted that the painting is published in the Polish Database of the Division of Looted Art of the Polish Ministry of Culture and National Heritage, and provided a link to the painting's identification and details on the ministry’s database. According to the lootedart.gov.pl website, the Ministry of Culture and National Heritage has, since 1992, been responsible for gathering information regarding cultural property lost from within the post-1945 borders of Poland with an aim at their recovery. The Polish ministry of culture and national heritage has stated that it is in contact with the auction firm and will undertake efforts to have the painting withdrawn from the upcoming sale. Henryk Hektor Siemiradzki (1843 - 1902) was born into a Polish noble family, the son of an officer of the Imperial Russian Army. He studied art in Saint Petersburg at the Imperial Academy of Arts, and later in both Munich and Rome. His paintings are inspired by the life of Greek and Roman mythology and he is believed to be one of the major interpreters of the so-called Arte Accademica, also known as Academic art, or academicism or academism, a style of painting, sculpture, and architecture produced under the influence of European academies of art which reflected the aesthetic canons of the past. In verifying the version of the painting in question, ARCA's own research identified three other distinct and original versions of the painting “The Sword Dance,” each with slight modifications by the artist in the composition. The master version, believed to have been completed in 1878 and catalogued as Schwertertanz in the catalog record of the Akademi der Künste zu Berlin, was acquired by Count Alexander Orlovsky. The present whereabouts of this version are not known. Another version, commissioned by Moscow merchant and collector K.T. Soldatenkov, was given to the Rumyantsev Museum at his death and now is part of the State Tretyakov Gallery collection in Moscow. 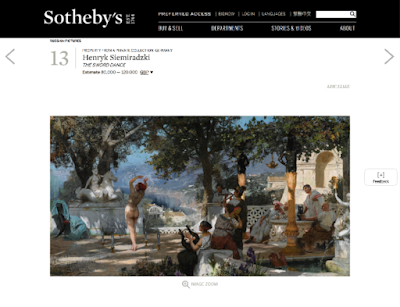 A third version of “The Sword Dance” was sold by Sotheby's on April 12, 2011 in New York. Listed as “Property from the Slotkowski Collection,” this version of the artwork sold for a record price of 2,098,500 USD, making it one of the 10 most expensive auctioned artworks from Poland. Franz Otto Matthiessen, an American sugar mogol, died in 1901. Artworks from his extensive collection were sold shortly thereafter. William Schaus, Jr. was the son of Wilhelm, later William Schaus, Sr., a German-immigrant art collector and proprietor of Schaus Galleries in New York City. It is not clear from the Sotheby's notation if they are referencing father or son, but the label on the frame of this painting reads "Schaus," making it clear that the painting passed through the Schaus Galleries, but leaving it vague as to who acquired the painting first, Matthiessen or Schaus, as Matthiessen often purchased from Schaus. This version of the painting reappears on the market in 1968 when Dr. Eugene L. Slotkowski, the founder of the Slotkowski Sausage Company in Chicago, acquired the work from an unnamed private collector. Estimating war losses incurred by Poland in the area of objects of art is difficult to assess, as the country suffers not only from a lack of complete archival materials but also changes in geographic territory, making establishing legal claims more difficult. What is certain is that scores of museum and private collections disappeared during the hostilities. While some quote Poland as having lost over 516,000 works of art (Archiwum Akt Nowych w Warszawie, zespól Ministerstwa Kultury i Sztuki), this estimate is likely quite low, as it only considers those claims established by former owners after the conclusion of the war. ARCA Trustee Erik Nemeth will be lecturing in Amelia this summer for the Postgraduate Program in Art Crime and Cultural Heritage Protection Studies. Dr. Nemeth is Director at CulturalSecurity.net and Adjunct Staff at RAND Corporation. He will be teaching “Cultural Security: Interrelations of art crime, foreign policy, and perceptions of security” between July 30 and August 10, 2012. In 2010, Dr. Nemeth published “The Artifacts of Wartime Art Crime: Evidence for a Model of the Evolving Clout of Cultural Property in Foreign Affairs” in Art and Crime: Exploring the Dark Side of the Art World (edited by Noah Charney) among other papers. In recent years, Dr. Nemeth has presented on panels at the American Society of Criminology: “Cultural Intelligence: data sources on the motivation and means for trafficking” (2009) and “Antiquities Trafficking – Complementary Countermeasures” (2010). ARCA Blog: Dr. Nemeth, If I understand what you said at the ASC in 2010 is that by looking at public auction sale catalogs, policy makers can understand if there’s a lucrative market for the cultural property of a region and a period. 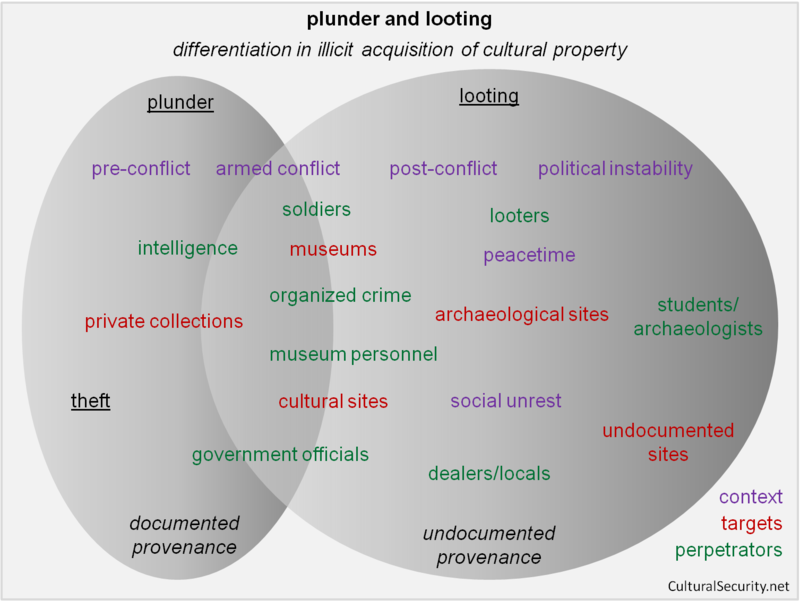 If policy makers understand that there’s demand for cultural property, they can then look at opportunities organized crime may have seized to hire local people to loot archaeological sites for more saleable artifacts and also look for weaknesses in the government that may lead to corruption. Did your studies indicate that certain regions are more susceptible to looting than others? Do you think the governments in these areas are utilizing available data to create policy to stem looting? Dr. Nemeth: I appreciate your asking about the research. I embarked on the study in 2009 to explore quantitative means of assessing risk in looting of and trafficking in cultural artifacts. By collecting data from auction sales archives, I had a chance to experiment with comparing changes in trade volume and average market value of cultural artifacts by geographic region of origin over a nine-year period. For the dataset to which I had access, African tribal art stood out as increasing along both parameters relative to classical antiquities, pre-Columbian art, Islamic art, and Indian and Southeast Asian art. After analyzing the data, I had two thoughts on how such analyses might support risk analysis. Does trading of cultural artifacts reflect political and economic conditions in regions of origin for the objects? 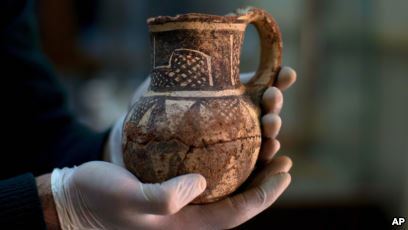 For example, quantitative measures of demand for cultural artifacts by region of origin over time could be compared against events in politics and economics for nations in the region. Can the auction market for cultural artifacts provide a quantitative, albeit indirect, measure of the illicit trade? The opaque illicit market has proven challenging, if not impossible, to quantify accurately. Perhaps a structured study of the auction market can help in devising a well defined estimate of the size of the illicit market for antiquities, tribal art, and other cultural artifacts. ARCA Blog: You will be teaching the course tentatively titled, “Cultural Security: Interrelations of art crime, foreign policy and perceptions of security.” Could you elaborate for our readers on what you will discuss in the classroom, the books you might assign, and what you think your students might discover while exploring this topic? Dr. Nemeth: Cultural security is a rapidly evolving field. I expect to expand on what the course will cover between now and the summer, but here is what I have in mind so far. I will start with what I would call a traditional understanding of the relationship between culture and security, namely protection of artworks and historic structures during wartime and restitution cases for and repatriation of cultural property after conflict. I plan to examine the relationship in different periods—World War II, the Cold War, and the post-Cold War—which have shaped the political clout of cultural property. The post-Cold War provides a lead-in to a perceptual dimension of the relationship with the targeting of religious monuments in political violence. The simultaneous increase in the financial volume of the art market since World War II adds an economic dimension and forms a relationship between culture and financial security. I consider myself an integrator of various disciplines in pursuit of an understanding of the evolving role of culture in identity and perception of security, and I anticipate that the students may have greater depth of knowledge than I in particular areas such as history of art, archaeology, criminology, and law. I trust that the students will gain an appreciation for the potential of bridging disciplines to enhance and expand their own areas of specialization. Accordingly, I plan to assign readings of cross-disciplinary studies. Here are a few examples of potential sources. Art and Crime: Exploring the Dark Side of the Art World brings together scholars from a range of disciplines, and Cloak and Trowel by David Price creatively examines the controversial relationship between security-intelligence services, anthropologists, and archaeologists. On the perceptual side, science can lend insight into the emotional and symbolic significance of artworks, and Inner Vision by Semir Zeki provides an intuitive introduction to the field of neuroaesthetics. I have other sources in mind, and I suspect that I will work in some of my own publications as well. Additional information may be found about Dr. Nemeth’s work at http://culturalsecurity.net. The Journal of Art Crime: Judge Arthur Tompkins Reviews "The Taste of Angels" and "Art Plunder: The Fate of Works of Art in War and Unrest"
In the fourth issue of The Journal of Art Crime, Judge Arthur Tompkins reviews "The Taste of Angels" (First American Edition; Little Brown and Company, Boston, 1948) by Francis Henry Taylor and "Art Plunder: The Fate of Works of Art in War and Unrest" (John Day, New York, 1961) by Wilhelm Treue and translated by Basil Creighton. Although both of these books are out of print, they can be found from second-hand internet-based booksellers, and are valuable sources for any student of art crime, writes Judge Tompkins. 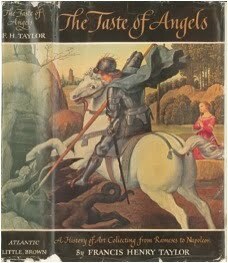 In "The Taste of Angels", a former director of New York's Metropolitan Museum of Art surveys the history of art collecting across a wide variety of settings, including the Pharaohs in Egypt, through the Hellenic and Roman Civilizations,the Italy of the Renaissance,the Medicis and the Papacy, and on to the fall of Napoleon. Wilhelm Treue's small (250 pages) work is an illuminating precursor to the modern study of art crime. According to Judge Tompkins, "it is probably the earliest work of serious scholarship that sets out to encompass, in a coherent form, the long history of art crimes committed during times of war." Judge Arthur Tompkins has been a District Court Judge in New Zealand for 11 years, having been appointed in 1997. He gained his Bachelor's degree in Law from Canterbury University, in Christchurch, New Zealand, in 1983, and subsequently graduated Masters in Law, with First Class Honors, from Cambridge University, England, in 1984. He has taught the Law of Evidence, and presented at numerous conferences and workshops on a variety of topics, including art crime, expert evidence, the intersect between law and science in courtroom, and forensic DNA, in New Zealand, China, England, Ireland, France, and Italy. He is an Honorary Member of Interpol's DNA Monitoring Expert Group, and an elected Fellow of the Cambridge Commonwealth Trust. He teaches "Art in War" at ARCA's Postgraduate Program in International Art Crime and Cultural Heritage Protection in Amelia each summer. To seek out this piece, and many others, consider a subscription to the Journal of Art Crime—the first peer-reviewed academic journal covering art and heritage crime. ARCA publishes two volumes annually in the Spring and Fall. Individual, Institutional, electronic and printed versions are all available, with subscriptions as low as 30 Euros. All proceeds go to ARCA's nonprofit research and education initiatives. Please see the publications page for more information.